I have just the recipe to help you use up some of those delicious summer berries! 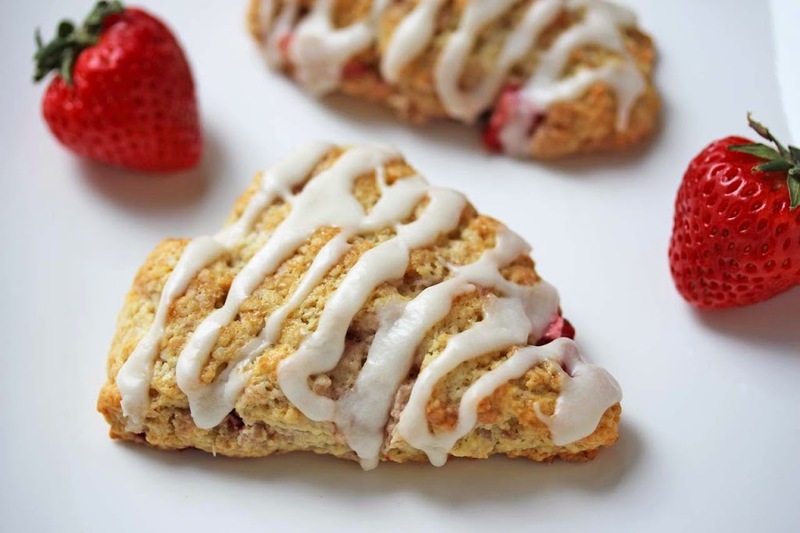 My strawberry and cream scone recipe, which is like breakfast and dessert all in one. A tender, slightly sweet crumb studded with chunks of fresh strawberries and sprinkled with some coarse sugar for an added bit of crunch. Then I finish the scones off with a sweet drizzle of cream glaze! I also recommend slicing one of these scones in half and topping it with some fresh whipped cream and sliced strawberries for a fun take on the strawberry shortcake! In a large bowl sift together the flour, salt, baking soda, cream of tartar and sugar. Add the cubed butter and cut it into the flour mixture until crumbly and some pea sized pieces of butter remain. Transfer the dough to a lightly floured work surface and pat the dough into a round with a 1-inch thickness. If the dough is a bit shaggy you can gently knead the dough 3- 4 times to further incorporate the ingredients. Cut the dough into 8 triangles and place them onto your parchment lined baking sheet. Brush the tops with some heavy cream and sprinkle with some turbinado sugar. Bake the scones for 15 -20 minutes until golden brown and firm to the touch. let the scones cool on the baking sheet. While the scones cool you can get started on the glaze. Note: for a thinner glaze add more heavy cream, for a thicker glaze add more confectioners sugar. In a small bowl mix together the sugar, heavy cream and the vanilla extract until combined and smooth. Drizzle the glaze over the cooled scones and enjoy! 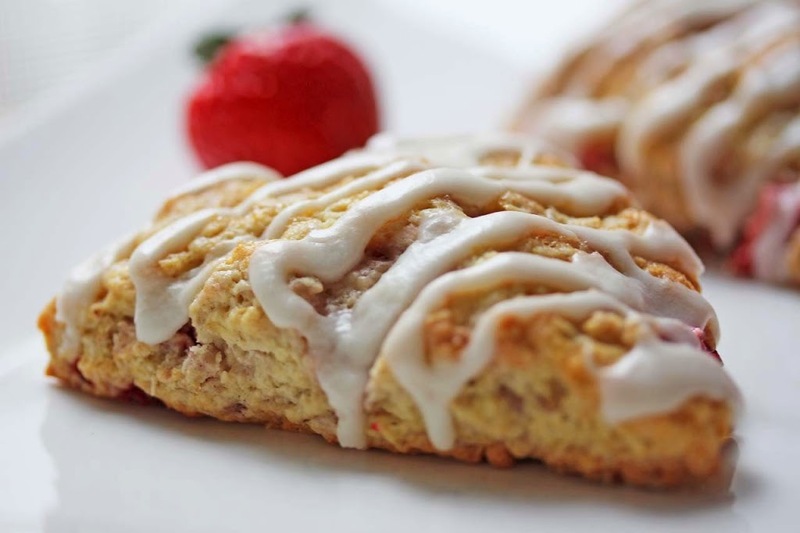 2 Responses to "Strawberry Cream Scones"
These look beautiful! I always buy strawberries in bulk and the last of them go bad before I can eat them. Solution found! Nice participating with you in the NYC Food Blogger Bake Sale a few weeks ago, too! Thanks Rachel! It was great fun participating with you as well for the NYC Food blogger bake sale. These scones will be perfect for those last bit of strawberries. I would love to hear how they turn out.